Cloud computing has a lot of hype surrounding it. More than a few observers have wondered what is so important about this new internet phenomenon. The truth is cloud computing is leading to a rethinking of the internet’s capability. Cloud computing promises to completely delocalise computing power and technology. Users will be able to access and manipulate files, images, videos and other data remotely. 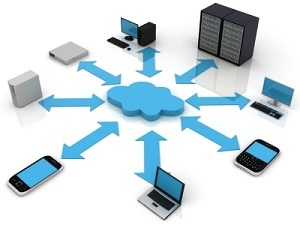 Cloud computing promises the ability to keep networks and mobile devices synchronised at all times. A bank of sophisticated computers host operating systems and data for hundreds, if not thousands, of customers. internet search engine giant Google pioneered the use of data centers to store clients’ personal data safely. The same principle is being extended to cloud computing. Huge data centers will act as remote desktop computers. These centers will be able to store every file a user would need. All the user needs is a counterpart machine that can be as small as a conventional laptop with much less weight. These so-called “netbooks” serve only to connect the user to the internet so he can access his files. An example of how cloud computing works – every device synchronises with the cloud, meaning that your data can be accessed anywhere! A single data center can offer multiple services and applications. Theoretically, a cloud computing system could perform almost any function or task the user desires. In a typical system, each application will have its own dedicated server combined with multiple iterations to create redundancy and prevent sudden malfunctions. The whole center is managed by a central server that constantly monitors the traffic and load volumes. Balancing the differences between machines, it seeks to maintain the harmony of the system and prevent crashes. The advent of cloud computing is actually forcing businesses to change their strategies. Previously, hiring a new employee meant providing him with a desk, computer equipment and various other hardware or software. Cloud computing allows them to reduce these capital expenditures significantly. Now all an employee needs is a computer with an internet connection to access his work data. Desks and office equipment may still be necessary, but the investment in computer hardware can be outsourced to cloud computing companies. The hardware and software demands on the business’s side decrease dramatically. Labor costs per individual employees go down, enabling a company to hire more workers. Productivity increases, raising the efficiency and profits of the business. The primary reason why cloud computing is getting so much attention is its effect on business strategies. The sheer cost pressure alone is forcing industry after industry to adapt to the new reality. The advantages notwithstanding, several valid concerns about cloud computing exist, namely having to do with privacy and security. Business owners and executives may hesitate to turn over their sensitive data to a third-party system with good reason. Losing access to their own data or having it compromised is unacceptable in a ruthlessly competitive private sector. One major argument against this fear is the fact that cloud computing companies survive based on their reputations. This gives them a huge incentive not to lose their clients data or compromise accessibility. Despite the power of this incentive, regulations may still be required to ensure safety. As for privacy, the obvious concern is the connection between the user’s computer and the cloud system. Privacy could easily be compromised by unscrupulous individuals who could access personal information like credit card numbers. A solution to this problem is to use authentication and encryption like regular secure connections. These practical concerns are somewhat overshadowed by a number of philosophical and legal questions. For instance, who owns the data stored by the cloud computing system? While it is held in the client’s name, a case could conceivably be made that the cloud computing system is the actual owner and therefore has a right to it. These technicalities are still under debate, and no resolution has yet been achieved. Cloud computing holds great promise for upending things as they are currently done in the business world. The practical effects on information technology jobs will likely be profound. These and other challenges must be met because cloud computing will continue to change the nature of the internet. Victor is a writer and blogger interested in technology and social media related topics. He works for a brisbane it services company and is an expert in cloud computing solutions. I just love cloud computing technology because it makes transporting my files so easy!…..One laptop dies, fire up another and don’t miss a bit….Even it reduces the maintenance cost required in maintaining large number of files. Cloud computing is like the next Internet phenomenal and its base looks strong. But you’re right, everything comes with a cost. In this case, privacy and security are big costs! Unless operators can come up with a good solution to protect “classified” information from companies, it’s hard for them to give away important information for a 3rd party entity. But it’s still a promising technology. We will see what will happen next! Thanks again for sharing man! Amazon uses it, Yahoo uses it, Google uses it and in fact, many companies are using it. Though Cloud computing may not sound safe, it has become the norm in computing and software. Yes they use it, but they own the servers that the data is hosted on! The introduction to cloud computing platforms has greatly benefited not only the IT sector but also the common people who are just using the internet. The concept of storage disk is going to disappear in the future when Cloud computing is fully deployed. The idea itself is great, but the matter of security is prime to me personally as I prefer anyone not to look into my private files. I am in doubts that it will be possible to trust a company – a third party. From my pont of view the matter of security will be very hot. Cloud computing is important as it provides safety to your data with enhanced privacy. It’s the best backup resource as of now and people are enjoying it. The cloud is definitely going to be the way of the future. To me it seems a bit like the industrial revolution but more of a data revolution. I can see the industry adapting to address the whole security issue however if you opt for the cheap/free options it is unlikely that your security issues will be resolved. I agree with those who claim that security is number one. I think we should try to develop and start working with clouds and then see how it works and what the troubles are. Now we can only speculate about it. Interesting and thorough article, thanks. Wi-Fi is everywhere these days so the Cloud opens so many new opportunities for mobile technology. The Kindle Fire web browser uses the Cloud to enhance the browser speed and store all your content – it works seemlessly. You wouldn’t realise it was doing it, but it delivers a superior experience than relying on traditional storage. Although the flip-side is you do need Wi-Fi or you won’t have access to that content unless you download it when you are in range of a Wi-Fi signal. Will be interesting now to see how many other tablet manufactures will follow down a similar route. Cloud computing is, in my opinion, one of the most exciting things happening these days in business. Dropping the “ball and chain” of the traditional office computer frees employees up to work while traveling, work from home and actually leads to more productivity. The mobility that cloud computing gives businesses these days is endless. While I do understand the security issues that arise from this scenario, in the end I believe those kinds of issues can be addressed and we will continue to discover more and more positive aspects of cloud computing. Thanks for your interesting comment, welcome to Technology Bloggers! Cloud computing is going to be the way how computer will work in the future. This has been predicted by many of the tech giants in the industry. I am a fan of cloud computing – it just makes life easier, more mobile and more economical. With security issues – that is one main issue for everyone and I believe that companies who offer data storage and the like is doing their job to secure the data of their customers and I believe that they still continue to explore ways on how to keep them more secured. I believe that the high level of security comes with a price – so opt of the premium subscriptions. Cloud computing does look like the future!